The Holy Week Encounter this year in Brignano has had as its most outstanding fruit, having delved into the figure of Saint Teresa, great teacher of the spiritual life and of prayer. The beloved Spanish saint, not well known in Italy, has captivated our hearts with her simple, direct and close style, with her experience of life, with her faith and with her ardent love for Jesus. She also has given us much hope since she was a "very human" saint and a woman "with her feet on the ground". She speaks as someone who has fought hard to get to the top and from there she encourages us to continue in our efforts, because it is worth having the "determined determination" to overcome all obstacles to reach the union with God. The encounter took place in the house of the Servant Sisters (known as "the convent" ), specifically in their classrooms, and began in the afternoon of Holy Thursday with a talk by Sister Sara L. about St. Teresa’s biography and her relationship with the Eucharist. We then elaborated on the topic in small group meetings. Afterwards we had dinner and then the time came to go to the parish in Brignano to attend Mass "in Coena Domini" at 8:30 p.m. At the end of the celebration, there was a guided Holy Hour before the Blessed Sacrament to accompany the Lord in those moments when he began his sorrowful passion. During that time we also had the opportunity to go to confession. 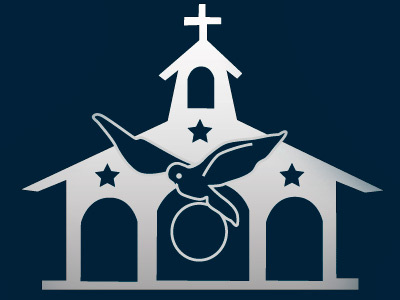 The following day we were asked to be at the church at three o'clock in the afternoon for the service of Holy Friday. We then had the second talk, “Saint Teresa and Christ's Humanity, some teachings of the saint”, given by Sister Rocio G. After studying in depth about this topic in the small groups, we showed a video on the Holy Shroud in which the sindonologist Emmanueola Marinelli explained to us with great clarity details on this prodigious object, from the scientific point of view and from the faith. After a frugal dinner, we headed to the parish where a procession of the Way of the Cross was about to begin through the streets of the village, in which we carried Our Lady of Sorrows and the Recumbent Christ on foot in a climate of prayer and silence, interrupted only by the interpretation of some pieces of music by the local band. On Holy Saturday we began with the recitation of the Divine Office and Morning Prayer (Laudes) at the parish at nine o’clock in the morning. 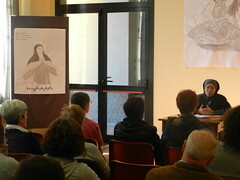 Afterwards we had the third and final talk, entitled "Saint Teresa, a teacher of prayer" given by Fr. 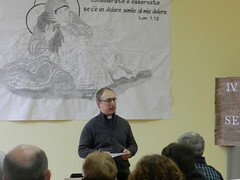 Francesco F., vicar of the parish, which was followed by a brief reflection on the subject with the groups. After lunch we saw some videos that were followed by the testimony given by Ombretta and Sergio, a Bresciano married couple who shared with us their experience after the loss of their first son, who was born with a serious illness and lived only 4 years. Upon learning of the illness of their son, they felt very clearly that this child was not theirs, but belonged to the Lord, and that he had been entrusted to them for a short but intense time. In this way, after his death, they understood that the Lord was calling them to continue that experience with other children not born to them, and since then they have welcomed into their home many young kids entrusted to them for a certain amount of time. It was a very good testimony that helped the adults to rethink many things in their family life. At six o'clock in the afternoon we all gathered, big and small, before an image of the Virgin Mary to pray the Rosary and accompany Our Mother in her loneliness. The children led the mysteries. In the final assembly they commented on their impressions and graces received in these days of being together. Throughout the encounter, the children had their own activities and workshops. They learned anecdotes about the life of Saint Teresa and made a mini book with the summary of her life. They also got to know the history of the "glass castle" of Saint Teresa: each one of us is a castle in which you have to enter and overcome the obstacles until you reach the room of the King (God), with the help of the mysterious lady (humility). All this became clearer in the “glass castle” game that was played. It was also interesting to discover the Holy shroud and through it learn more about the passion and resurrection of Jesus. Finally, we did not miss the opportunity of painting eggs that would be blessed on Easter. Also a couple of episodes of the resurrection of our Lord were acted out. The encounter concluded with the celebration of the Easter Vigil in the parish, which introduced us to the great joy of the Resurrection of Jesus Christ.